Just a heads-up, this post contains code examples for an out-of-date version of huey. If you're interested in seeing current example code, check out the documentation or this blog post. At my job we've been doing a quarterly hackday for almost a year now. My coworkers have made some amazing stuff, and its nice to have an entire day dedicated to hacking on ... well, whatever you want. 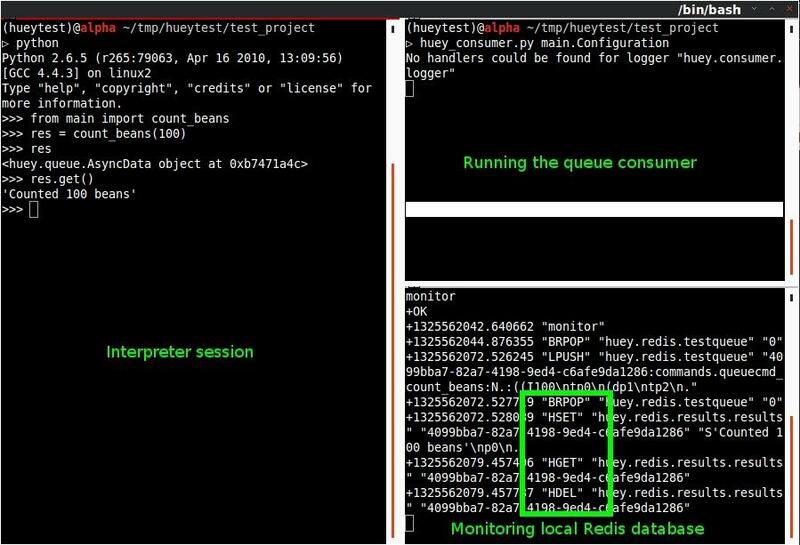 Tomorrow marks the 4th hackday and I need to scrounge up a good project, but in the meantime I thought I'd write a post about what I did last time around -- a lightweight python task queue that has an API similar to celery. I've called it huey (which also turns out to be the name of my kitten). Backend storages implement a simple API, currently the only implementation uses Redis but adding one that uses the database would be a snap. The other main goal of the project was to have it work easily for any python application (I've been into using flask lately), but come with baked-in support for django. Because of django's centralized configuration and conventions for loading modules, the django API is simpler than the python one, but hopefully both are reasonably straightforward. If you're using django, you can simply call the management command django-admin.py run_huey. If you'd like to read more, I've written up some documentation, which has step-by-step instructions for getting started and provides a comprehensive overview of the API. I've been running the consumer for several months now on a couple of sites and have been very pleased with it! I hope you find it useful, too.